Genetics: Golden Goat is the barnyard love child of Mr. Dank's Island Sweet Skunk, Romulan, and Hawaiian. Flavor and Aroma: GG's scent and smell are of an oriental menu nature. Sweet and sour, with a dash of tropical fruit. Effects: Golden Goat's effects are felt in a trippy head high and a mellow body buzz. 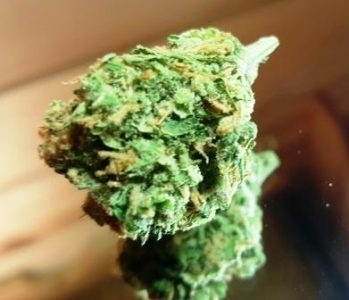 Medicinal Uses: Moderate aches and pains can be alleviated due to Golden Goat's mind and body buzz. Stress and anxiety are decreased for many patients. Potency: THC levels vary from the low teens up to 20%. CBD is usually down around 0.05%. Grow Info: About 10 weeks of flowering will produce a high yield. Review of the sample we tested: Golden Goat is a hybrid cross between Hawaiian, Romulan, and Mr. Dank's Island Sweet Skunk. We stopped by CannaCo in Trinidad, Colorado and selected some beautiful, compact, lime green buds loaded with orange hairs. Samples tested at just over 24% THC and 1% CBD. Flavor & aroma of Golden Goat is like tropical fruit covered with sweet and sour sauce. Effects are an instant, heady, trippy high, followed by a nice body buzz without too much couch lock. Medical benefits associated with Golden Goat include help with stress and depression, and mild pain relief due to the body effects. Golden Goat is like a vacation in a bowl. The tropical fruit taste and smell will release you into a trippy island paradise and any stress or worries will be left at home. Find it at WeedSearch.com. Please subscribe to our YouTube channel and Like us on Facebook. This video was produced by and intended for WeedSearch.com use only.